A 21-car crash was one of several in the closing laps of the Daytona 500 Sunday. Hamlin won NASCAR's biggest race for the second time in four years Sunday, leading JGR in a 1-2-3 sweep of the podium in overtime. The race and the season have been dedicated to J.D. Gibbs, Joe Gibbs' eldest son who died last month after battling a degenerative neurological disease. J.D. Gibbs helped his father start the race team, ran it while Joe Gibbs was coaching the Washington Redskins, was a tire changer on the team's first Daytona 500 victory and the one who discovered Hamlin during a test session at Hickory Motor Speedway in North Carolina. Hamlin was hired to drive the No. 11 — the number J.D. Gibbs used when he played football — and J.D. Gibbs' name is on the Toyota. "The whole family, they did so much for me over the course of my career, and this one is for J.D," Hamlin said. "We are desperately going to miss him the rest of our lives. His legacy still lives on through Joe Gibbs Racing and proud to do this for them." Hamlin was met in victory lane by the entire Gibbs family, including J.D. 's widow and four sons. Joe Gibbs, the Hall of Fame NFL coach with three Super Bowl victories, ranked the tribute win to his son first in his career accomplishments. J.D. Gibbs encouraged his father to move the team from a crowded-Chevrolet camp to become Toyota's flagship team in 2008 and the Daytona 500 victory was the 100th for JGR in a Camry. "It is the most emotional and biggest win I've ever had in my life, in anything," Gibbs said. "It was the most important night in my occupational life. I know J.D. and everybody in my family was emotional." "I hope a few of you drivers out there will get down on the bottom with Denny and Chase and put on a good show today," France told the field. The drivers obeyed and delivered an action-packed and wreck-filled running of "The Great American Race." 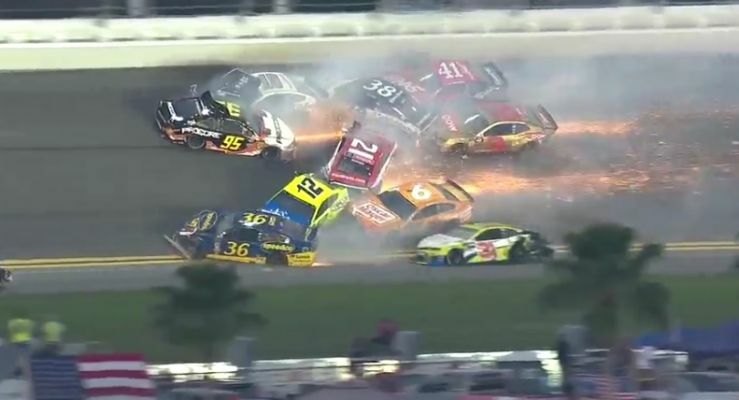 There was an accident on pit road, a 21-car crash, 12 cautions and five wrecks in the final 20 laps of regulation. The race was stopped twice for cleanup totaling nearly 40 minutes in the final stretch. During the second red-flag, one of NASCAR's track-drying trucks broke down while cleaning oil off the racing surface. "I just told him that my team doesn't pay me to push Joey Logano to a win," McDowell said.